the pink toque. a craft blog: Happy Easter! 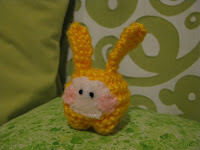 Just in time for Easter, I whipped up a new little design: meet my tiny knitted "gribbly bunny!" 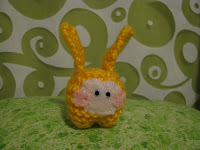 This little guy is made from satin-y acrylic yarn, which makes it really smooth and easy to work with. The pattern is one I developed myself, and I have plans to make various creatures based on the same design in the future. The series will be called "gribblies"
So these are just tiny little insignificant creatures hiding in nooks and crannies that will do little more than just irritate you if they cross your path. They like to pester and annoy whomever they come in contact with, and I like to believe that gribblies are to blame for all of those little irritating setbacks in your typical day. Having a bad day? Blame it on the gribblies! Stay tuned for more in the series down the road when I get time to create all of the ideas in my head for other little gribblies :) There just aren't enough hours in the day!